The Bridging to Tomorrow Project, which included the construction of the Chief Mistawasis Bridge, extensions of Central Avenue and McOrmond Drive, and replacement of the Traffic Bridge is complete! Thank you to everyone who attended the opening celebrations on October 2, 2018. We've been documenting the Bridging to Tomorrow Project all along. We hope you will enjoy this documentary. To see photos from the opening events, visit the City of Saskatoon Facebook page. Two clay berms (walls) have been installed View of the construction site looking northwest. from draining into the work zone. south in-river pier and the pier has been excavated. ​pier to install reinforced bar. February 12, 2016: Project Officially Launched! February 4, 2016: North Span of Traffic Bridge Coming Down February 7 @ 8:30 a.m.
January 5, 2016: South Spans of Traffic Bridge Coming Down January 10 @ 9:00 a.m. The North Commuter Parkway and the Traffic Bridge Replacement Project is part of the Bridging to Tomorrow initiative. 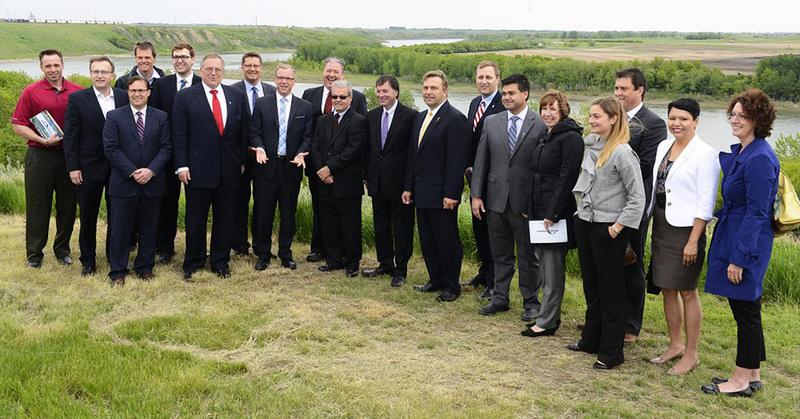 Both will provide significant benefits to the citizens of Saskatoon and the province. Making strategic investments in public infrastructure to address the existing travel demands of our rapidly growing city and province. Having effective and efficient infrastructure that is integral to the jobs, growth, and prosperity that defines the remarkable performance of the Saskatoon economy, which is critical to the quality of life enjoyed by our citizens. Providing critical commuter connections in key areas of the city, addressing traffic congestion, reducing intersection delays, shortening travel times, and reducing greenhouse gas emissions. Ensuring reliable and responsive service, using strong management and fiscally responsible strategies, communicating effectively, and demonstrating innovation and creativity. Achieving our strategic goals related to continuous improvement, asset and financial sustainability, quality of life, moving around, environmental leadership, sustainable growth and economic diversity and prosperity. Achieving the planning goals for the Growing Forward! Shaping Saskatoon initiative. 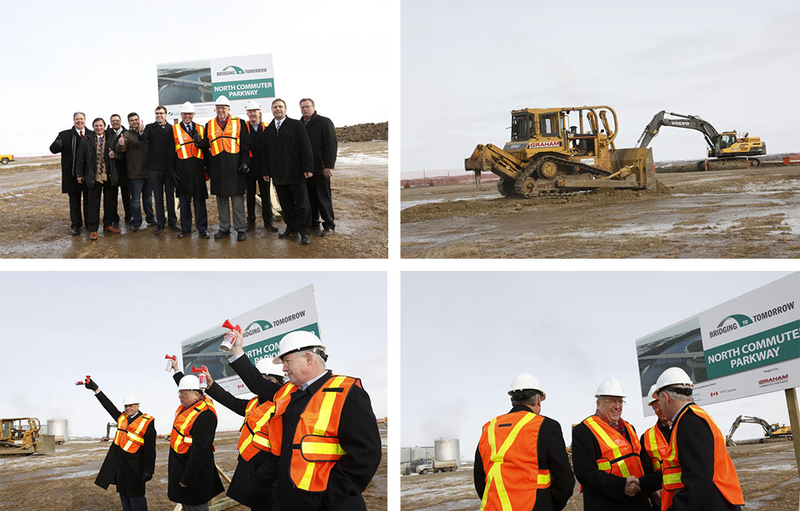 Formerly called the “North Commuter Bridge”, the North Commuter Parkway project will link the Marquis Industrial area with the University Heights area, by extending Marquis Drive across the South Saskatchewan River and connecting to McOrmond Drive at Fedoruk Drive. This drone video shows the future site of the North Commuter Parkway. Marquis Drive will be extended to connect to a new 270 metre long, six-lane bridge. A six-lane arterial roadway will connect Wanuskewin Road to the bridge. Pedestrian and cyclist facilities will be constructed. McOrmond Drive will be extended to connect to the new bridge. Central Avenue will be twinned and extended to intersect with McOrmond Drive. Sound attenuation requirements will be evaluated for existing residential areas along Central Avenue north of Attridge Drive. McOrmond Drive will be five lanes between the bridge and the intersection with Central Avenue, and then four lanes east of the intersection with Central Avenue. Improvements will be made to the intersection of Central Avenue and Attridge Drive. Help to increase economic productivity in Saskatoon by significantly reducing traffic congestion in the City's North Industrial Area. Traffic volume on opening day is expected to range from 14,600 to 21,700 vehicles per day. This will result in a nine per cent reduction in existing traffic using the Circle Drive North Bridge and additional reductions in traffic across the City’s other river bridges. With a future population of 300,000, up to 40,000 vehicles are expected to use the Parkway each day. At a future population of 400,000, over 50,000 vehicles are expected to use the Parkway each day. The bridge will also have a 2 meter wide bikeway on the north side and a 3.5 meter multi-use pathway on the south side. Both will be at the same elevation as the driving surface. As part of the North Commuter Parkway Project, the swale crossing is the location where there has been some public interest in constructing a crossing for animals. During the approval process, the swale crossing was a major point of consideration for the City and the MVA. After studying the various wildlife in the area, it was resolved to install culverts with the bottom portion covered in earth to allow small amphibians to cross the roadway using the culvert, and speed limits were set at a maximum of 50km/hr through the swale area. More substantial wildlife overpasses or underpasses are typically used where major wildlife crossing corridors intersect high speed highways or freeways, which is not the case in Saskatoon. Therefore, we are confident that the solution being implemented will result in a safe and reasonable environment considering all factors. Based on an estimated design and construction starting date of fall 2015, a completion date for the project has been set for late 2018. Under the City's Strategic Goal of Quality of Life, this naming process supports the recognition of our built, natural, and cultural heritage. The naming of civic facilities celebrates the history, environment, and outstanding contributions of our diverse community. The new Traffic Bridge will be a four span arrangement, with new reinforced concrete piers constructed around the existing piers within the river. The bridge geometry will be similar to the old bridge, but will be slightly wider and taller to accommodate wider traffic lanes, wider pathways on both sides, and overhead clearance for emergency vehicles. In compliance with the requirements of the Project Agreement, the new bridge structure will be a modern truss structure and will include two 3.7 m wide traffic lanes and two 3.0 m multiuse pathways. The project will include direct pathway connections to Rotary Park, however the configuration of these has yet to be confirmed by GCP. The Traffic Bridge was closed in August 2010 due to public safety concerns as a result of advanced deterioration of critical structural members. 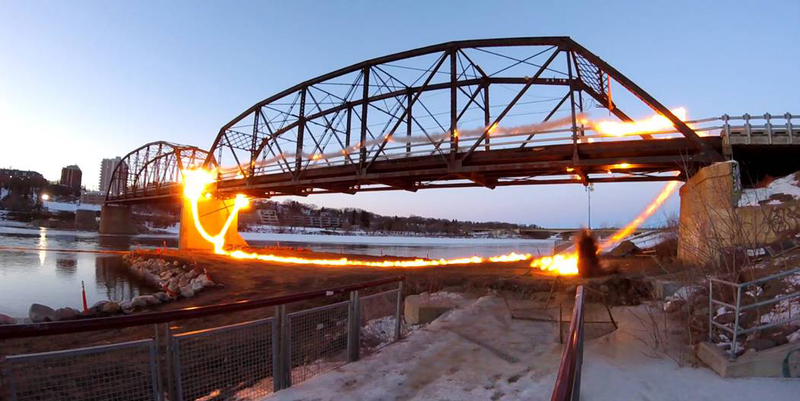 Following extensive public consultations and a Needs Assessment and Functional Planning Study conducted on the existing Traffic Bridge, a decision was made by City Council to replace the existing bridge with a modern steel truss bridge with multi-use pathways on either side. The new Traffic Bridge will provide an important link for commuter, pedestrians and cyclists crossing the river between downtown and residential areas in the south part of the city. The design will provide a unique look, maintaining elements of the original heritage and character of the existing bridge, while meeting modern bridge engineering standards. The existing vertical profile of the bridge will be retained and the overhead clearances will be maintained, and existing traffic movements to enter and exit the bridge on either side of the river will be maintained. Conventional weathering steel is being used with a protective coating within the splash zone for the truss elements of the new Traffic Bridge. This will result in a two tone colour between the lower and upper portions of the structure until the patina can form on the exposed portions of the weathering steel. This process will eventually turn the entire bridge into one brown colour tone. Provide an important linkage for motorists, pedestrians and cyclists crossing the river between the downtown employment area and residential areas in the south sector of the city, and will support the growing city centre. Play a significant role in providing access to the downtown area by offering an additional way to cross the river, particularly when other core river bridges are undergoing maintenance. Enhance the movement of pedestrians and cyclists with wide 3.0 metre multi-use pathways located on each side of the bridge. Cyclists may also travel in the driving lanes, which will be marked with sharrows. Provide 3.7 metre wide driving lanes that will enable emergency vehicles like fire trucks to use the bridge, and make the bridge a potential transit route. The wider lanes will also reduce the frequency of side-swipes and collisions. Accommodate average traffic volumes estimated to approach 11,000 vehicles per day, with capacity to serve over 20,000 vehicles per day. Anyone interested in viewing progress of the Traffic Bridge construction can do so through a live webcam feed available on the GCP website. 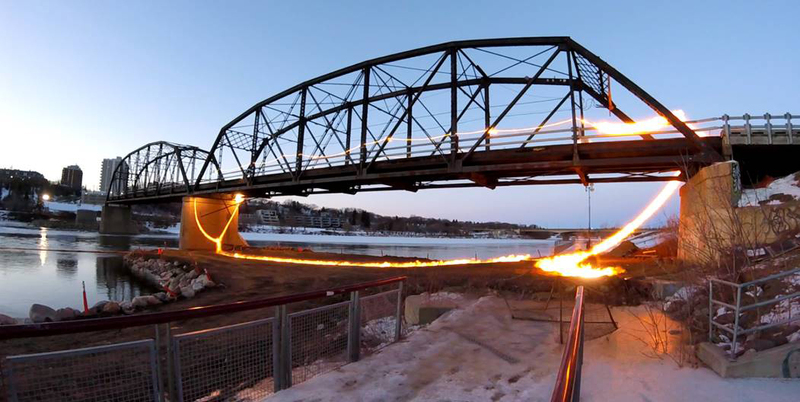 A drone video of the old Traffic Bridge can be viewed here. The estimated capital cost of the North Commuter Parkway is $211.4 million, and the estimated cost to replace the Traffic Bridge is $41.2 million. The total estimated capital cost to construct Parkway and replace the Traffic Bridge is $252.6 million. In May 2013, City Council approved that the North Commuter Parkway Project, which is combined with the Traffic Bridge Replacement Project to take advantage of joint financing and competitive pricing; and that Administration continue to pursue available funding for these projects from the Federal and Provincial Governments. A funding application was submitted to PPP Canada (P3 Canada) in June 2013. The P3 Canada Fund is focused on provincial, territorial, municipal and First Nations public private partnership infrastructure projects. The amount of the funding support, in combination with any other direct federal assistance, may not exceed 25 per cent of the project's direct construction costs. The Business Case for P3 Funding will be used to help the City and PPP Canada make decisions with respect to the construction and development of the North Commuter Parkway Project and the Traffic Bridge Replacement Project. On June 9, 2014, P3 Canada announced the Government of Canada will contribute up to $66 million of the direct construction costs to build the North Commuter Parkway and replace the Traffic Bridge. The Province of Saskatchewan also announced a contribution of $50 million to be used to help fund the building of the Parkway. The City of Saskatoon will contribute the remaining funds to complete the project. Watch a video of the announcement. Based on a confirmation date for funding in June 2014 and design and construction start date of fall 2015, a completion target for the project has been set for October 2018. The RFP was developed with the City's external consultants based on the City’s functional plans and industry best practices. Based on a draft Project Agreement containing project terms and conditions that will be supplied, teams will provide technical and financial specifications regarding how they will design, construct, finance, operate and maintain the project over a 30-year operations/maintenance period. Technical submissions will be scored on a pass/fail basis, with 70% being the threshold to proceed to the financial plan and price submission. The financial plan will also be scored on a pass/fail basis. Only teams with a score of 70% of higher will have their price submission evaluated. The price submission will include capital construction costs, operating and maintenance costs, and renewal costs over the 30-year term of the project. The Preferred Proponent will be the Team that passes both the technical submission and the financing plan, and has the lowest price submission, on a net present value basis. The project’s Fairness Monitor will be involved in every step of the RFP process to ensure the City conducts the RFP process fairly and in accordance with the RFP documents and good industry practice.